I’m pretty sure we’ve all heard of the “little black dress” that’s considered a wardrobe MUST HAVE. A black dress is good to have on hand for anything. A wedding, a funeral, a birthday party, a cocktail party, a bachelorrette party or just a fun date night out with your hubby. You can always change the look of a little black dress with accessories, bags, belts and shoes. It’s just one of those staple pieces that’s good to have in your closet in case of emergency. There are five other items that I consider “must haves” when it comes to perfecting my wardrobe. I like pieces that can be worn multiple ways, giving you multiple different looks. Things that can be worn casually, or dressed up if needed. So today, I’m sharing with you five wardrobe must haves that have made my life a whole lot easier. 1.) 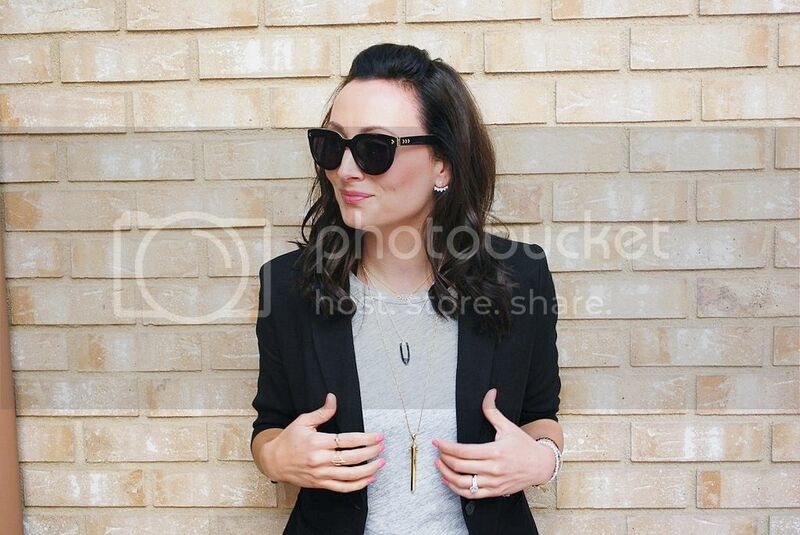 A Classic Blazer – I love love love my black blazer. Did you get that? I can’t live without it. Actually I had a black blazer for YEARS and lost it. I tried living without it for 1 month and quickly realized that it was a go-to piece for me and needed to re-purchase one immediately. The best part about having a classic black blazer in your closet is that it can be worn with ANYTHING. You can wear it with your work attire, over a plain T-shirt with jeans, over a dress, with jean shorts, the list goes on. It can easily dress up any outfit…for example, see above. It totally adds a different feel over a T-shirt and jeans than if I was just wearing the T-shirt and jeans alone. It adds a more “put together” feel that is perfect for those times of wardrobe crisis. (I know you’ve had one). 2.) A Good Pair of Ripped Boyfriend Jeans – When I think of comfy-cool jeans, I think of ripped boyfriend jeans. A little loose fitting but flattering at the same time. My ripped moto boyfriend jeans from Topshop are a regular in my wardrobe. They look good with a plain tee or tank and you can dress them up with heels or flats. Bonus: They are perfect for spring when it’s not hot enough yet to wear shorts. 3.) The Perfect T-shirt – I did a post a while back about the perfect pocket tee which is still in constant rotation in my closet. It’s really important to have at least a couple of T-shirts that fit you perfectly, are comfortable and are neutral colors (aka white, black, grey). They are good to have for wearing under sweaters, blazers, vests or for just everyday wear with jeans. If I find a tee that fits me well, I buy it in at least two colors. Jcrew literally has an entire section of their store devoted to t-shirts….aka they’re an important staple for any wardrobe. 4.) 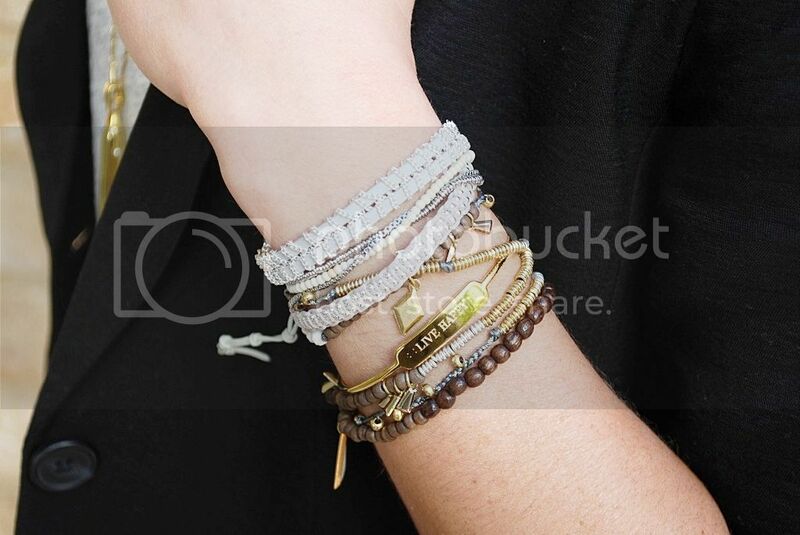 A Good Layering Piece of Jewelry – So not everyone is a jewelry person and that’s TOTALLY ok. Some people need easy accessories, that they don’t have to think about but say “put together” when they wear it. 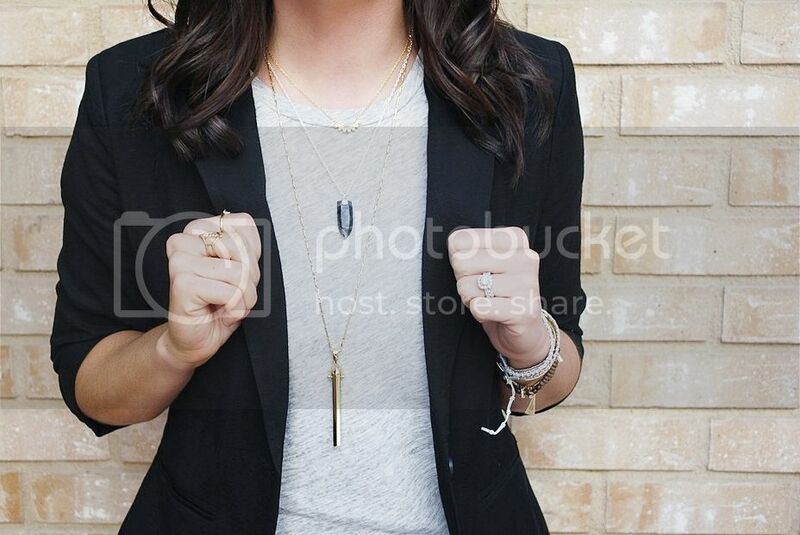 If there is one piece of jewelry that is a staple in my wardrobe, it’s a longer layering piece. Silver or gold? Whatever you will wear most. 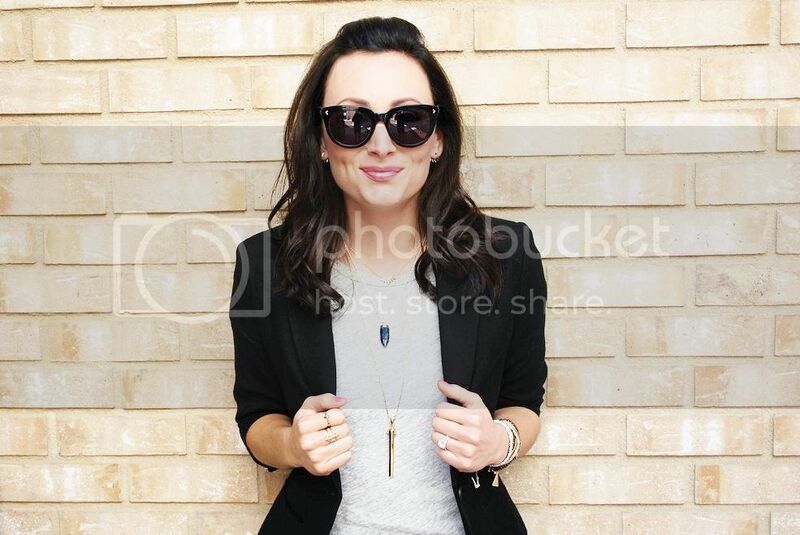 The Stella & Dot Rebel Pendant is still to this day one of my best sellers. You can wear it alone or layer it with a shorter delicate piece to add a little more pazazz. It’s a classic, gorgeous piece that adds the perfect touch of pretty to any outfit. It matches with everything. Tees, dresses, pattern blouses, v-neck tops, collared shirt…you name it, you can wear the Rebel Pendant with it. And it’s just SO easy. 5. ) 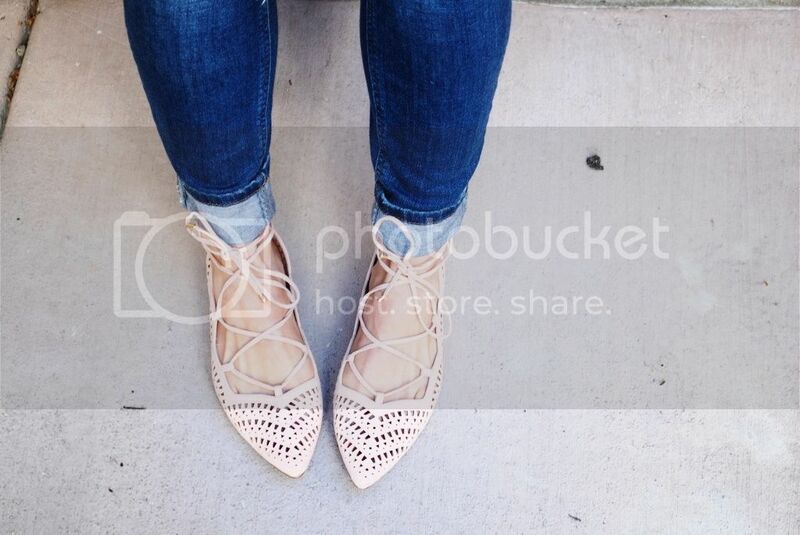 Lace Up Flats – Last spring, lace up flats became “a thing”. Super popular, easy to wear and just plain cute. Well, it’s spring again and they are JUST as popular, if not maybe even more. They are one of those shoes that can be worn with jeans, dresses, and even black pants for work. One of my favorite ways to wear them is just with a classic T-shirt and jeans. They add a simple pop of color and trust me when I say people gravitate towards them. Another great thing about lace up flats is that they are SUPER comfortable. I have a couple of pairs, different colors/patterns/brands and all of them have been so comfy. 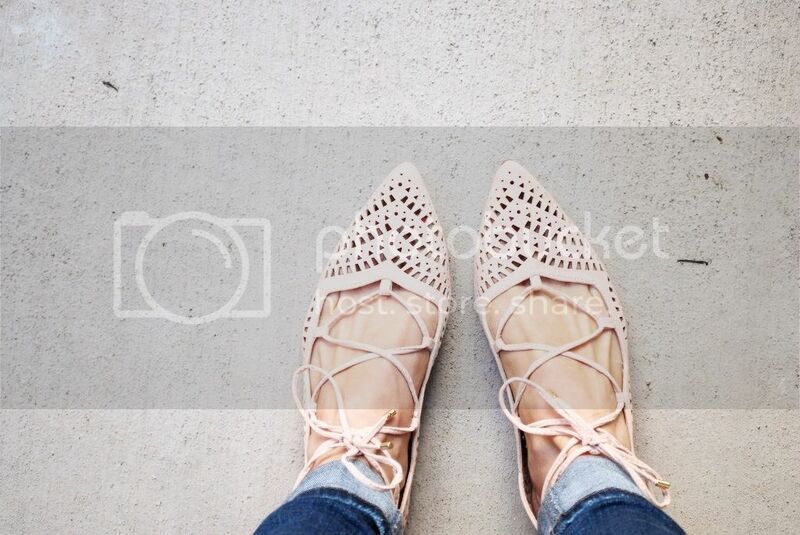 Lace up flats add an instant pop of gorgeousness to any outfit, which is why they are a must-have for me. All five of these pieces have really made my life easier when it comes to styling outfits and conquering that dreaded feeling of “having nothing to wear”. If I get in a style slump – a tshirt, ripped jeans and lace up flats are my go-to. If I need to be more dressed up, I add a blazer and some jewels. It’s as easy as that. 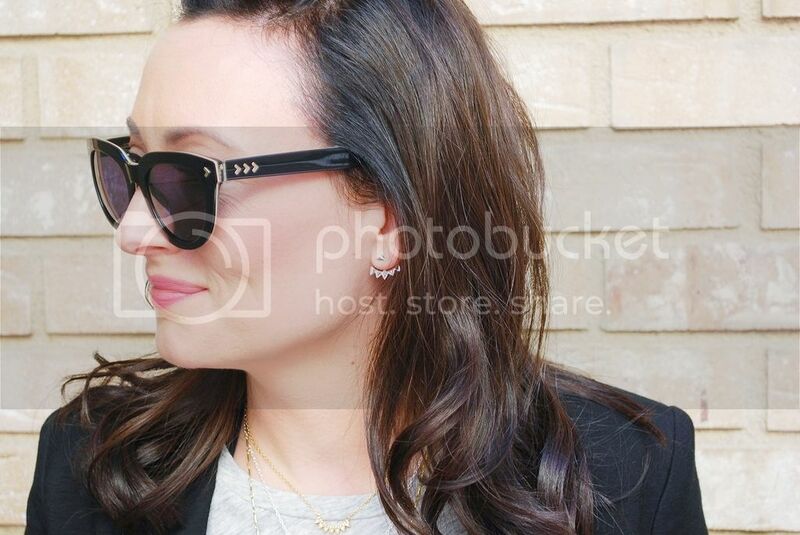 Sidenote: How cute are the new Stella & Dot sunglasses I’m wearing? They are a new product for us and they are selling out FAST. If you have a pair of sunnies from the new collection on your wishlist, buy them now because they won’t be available till Fall. (Don’t say I didn’t warn you.) Click HERE to order through my site. Totally agree with the black blazer! Goes with everything and can add a little more "dress up" to the outfit. Love the shoes!